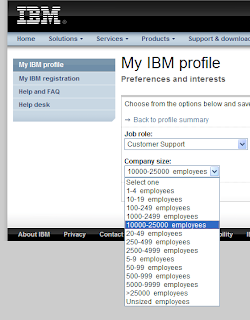 This classic example of clumsy web form design brought to you on the IBM customer enrollment profile form. Screen shot on 15 Nov 2010. What does this form say about the company ? Lack of attention to detail, does not customer test web interfaces, cannot tell the difference between a number value and alphabetic sort ? 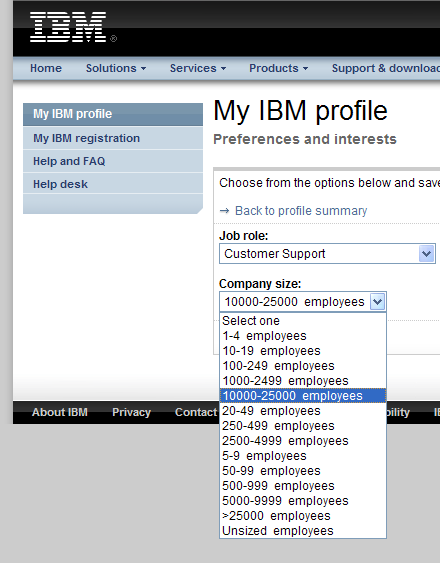 Its says all of that along with making me grin as I struggle to find the correct selector for 8 employes. Oh and what the heck are "unsized employees"